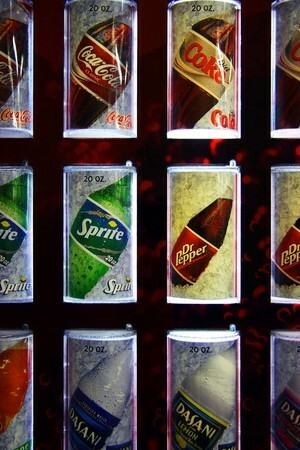 Mia's Domain: Health Dilemmas: Should I Give Up Fizzy Drinks? On a hot day do you reach for a cool can of Coke or a glass of water, and does it matter? Obesity (the body doesn't seem to regulate its appetite in response to calories in drinks so the sugary drinks are extra calories), dental caries and an increase in diabetes are uncontested risks of drinking sugary fizzy drinks. Fatty livers and pancreatic cancer have also more recently been linked to a hefty intake of sugary, fizzy drinks (up to four cans a day) by researchers, but the studies are not conclusive. Those of us watching our weight, meanwhile, may have switched to diet drinks, which contain artificial sweeteners, some many hundreds of times sweeter than natural sugars, but without the calories. Coca-Cola's website says Diet Coke, Coke Zero and Lilt Zero contain aspartame and acesulfame-K. Slimline drinks such as Schweppes slimline Canada Dry ginger ale contain a blend of aspartame and saccharin. Aspartame has been dogged by controversy ever since it was approved as a food additive over 35 years ago. A report in the Daily Mail last week said that the European Food Safety Authority (EFSA) is being asked to bring forward a safety review of it by members of the European parliament following a Danish study showing an increase in premature births in mothers drinking diet drinks and research showing cancer growth in mice who were fed aspartame. Interesting post! I am forwarding this to my mom!